Carmarthenshire raise £521,000 during their Royal Welsh feature county year. 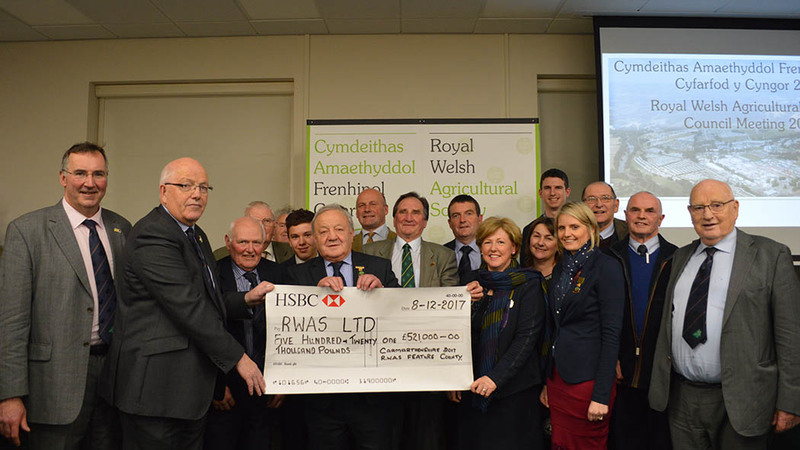 In total the accumulation of two years hard work has resulted in Carmarthenshire, this year’s Royal Welsh feature county, raising an impressive £521,000. Carmarthenshire’s successful feature county year has come to a close as their term of office ended at the society’s recent annual council meeting, where Team Sir Gâr presented their final cheque. Ably led by president, Brian Jones, Carmarthenshire have had a record breaking year in more ways than one. David Lewis, chair of council for the Royal Welsh Agricultural Society, said: “I would like to thank and congratulate Brian, Helen and the whole of Team Sir Gâr for their outstanding enthusiasm, energy and commitment throughout their term as feature county. The Carmarthenshire team has had had a very successful couple of years fundraising for the society’s equine project. With the resources already invested in the project from the 2015 feature county of Gwent, work on the equine project is already in full flow. With over 3,000 horses entered at the Royal Welsh Show, together with the strength of the horse sections at our Winter Fair, Spring Festival and horse sales, the importance of horses is fully understood by the society and we are delighted that with the continued support from Carmarthenshire, the project to improve the quality of the equine facilities on the showground can continue. Following in the footsteps of the 2017 feature county of Carmarthenshire, it is now the turn of Montgomeryshire to take up the mantle for forthcoming year of 2018, with Tom Tudor now taking the presidency baton. Having lived and farmed in Montgomeryshire all his life, Mr Tudor is a pillar of the local community. He runs beef and sheep at Llysun and relies totally on grassland farming, and together with wife, Ann and son, Richard, Tom has worked hard to earn the reputation of having an excellent grassland management system in the upland areas.